Maintain NEUTRAL with lower DCF-derived Target Price of SGD1.90 (WACC: 7.5%, TG: 1.5%) from SGD2.50, 10% upside and backed by > 9% dividend yield in 2018F. We cut our FY18F-20F core earnings by 8-16%, factoring in weaker pay-TV revenues, higher ARPU dilution from MVNO aggression/take-up of SIM-only plans, and weaker EBITDA margin as a whole. StarHub is the worst performing telco on the FSSTI, down 39% YTD on concerns over mobile competition, with valuations at -2SD below historical EV/EBITDA mean. Prefer Singtel (Rating BUY, Target Price: SGD3.90) for sector exposure. MyRepublic, StarHub’s maiden mobile virtual network operator (MVNO) has unveiled three SIM-only plans in the market. MyRepublic’s plans start at SGD35 with 7GB (additional 3GB for MR customers) data bundled. Mid and higher tier plans are priced at SGD55 and SGD85, for 12GB and 25GB respectively. Although the prices do not undercut existing MVNOs, we see some risk of cannibalisation with StarHub’s existing SIM-only plans. MyRepublic’s plan offers greater value with larger data inclusions based on a similar SGD34 plan (S plan) from StarHub. StarHub’s mobile service revenue (MSR) fell by a steep 10% q-o-q in 1Q18 vs 2-4% contraction recorded by its peers. Its postpaid base fell 3,000 q-o-q. Competition is likely to intensify with MyRepublic eventually bundling mobile service with fibre broadband packages. A failed negotiation with Discovery Networks on fair pricing will see 11 pay-TV channels axed in stages over the next two months. To fill the void, seven new first in Singapore/Asia channels will be introduced on a staggered basis from 3 Jul. We believe content realignment as inevitable and a reflection of the tough pay-TV market. 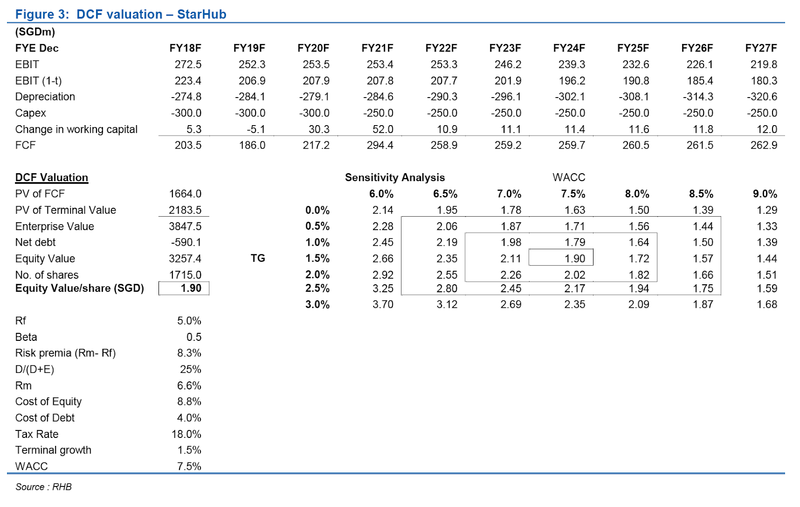 StarHub has been losing pay-TV revenues on a y-o-y basis for the past 12 quarters (1Q18: -10% q-o-q post Singapore Financial Reporting Standards (SFRS) 15), while pay-TV subs have declined for 11 quarters in a row. It is not clear if the newer, more cost effective channels will improve the economics of the pay-TV business. Incoming CEO, Mr Peter Kaliaropoulos officially takes charge on 9 Jul, replacing Mr Tan Tong Hai who resigned earlier. Peter Kaliaropoulos is a telco veteran with over 35 years of experience (BT, Telstra, Optus Ooredoo) and ex-StarHub. His entry is keenly awaited and could not have been at a better time with StarHub battling intense competition. While it is not immediately clear what his outright KPIs are, we think shareholder value creation would be one of the key priorities. Peter Kaliaropoulos’s most recent stint was with Zain in Saudi Arabia, where he led the company to its maiden profit in 2017 after a decade of operations. We lower our FY18F-20F core earnings by 8.3%, 16.5%, and 12.2%, factoring in higher ARPU dilution from SIM-only plans, weaker pay-TV revenue, and lower EBITDA margin as a whole. Post earnings downgrade, our forecasts are 8-9% below consensus for the next two years. Key risks are stronger-than-expected competition and lower-than-expected dividends.